These 55 exquisite paintings by Canadian artist Andree Pouliot are made in card format. They show the wondrous and mythical world of the Orient and they inspire in us the age old art of story telling. Each card is a filigree doorway opening into a roomful of associations and meaning. Every picture is a magical carpet taking us again to the King's moonlit chamber, where his fearful heart was gently overpowered by a woman who was as brave as she was beautiful. With the spinning of fabulous tales, 1001 of them to fill the sleepless nights, Scheherezade saved her life day after day. 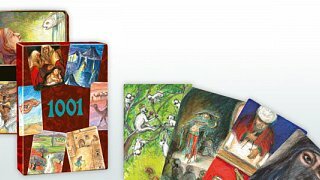 With the 1001 deck, we can also be inventors of tales in which everything is new and everything is possible. No tale gets told twice and with every shuffle of the deck, the possibility for new stories and imagination soars! 1001 is a companion deck to the SAGA and MYTHOS decks and can be used on its own, or in combination with them. 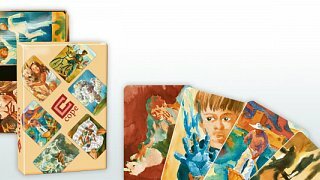 These 55 cards, selected images out of his most beautiful paintings, are an invitation to journey in fantasy to the South Seas. We can create our own stories based on Gauguins motifs. 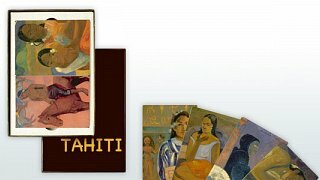 The TAHITI cards, like tantalising pieces of a greater mosaic, captivate the viewer´s eye for detail and invite us to extend them with our own creative fantasy. Paul Gauguin (1848 ' 1903) created the vivid works of his later life on the remote islands of Tahiti. He expressed his fascination for the culture in paintings that sought to fulfill his deep longings for beauty and original innocence. He painted scenes of daily life, the countryside and people, mostly women. Images rich in poetry and an apparent harmony that seemed indigenous to paradise pervade the works. Food is prepared wherever people live and we all enjoy and appreciate a good meal. With QUISINE, the players become the cooks. Each card has a picture by graphic artist Anke Siebert of two different food items. From these the players choose their ingredients for dishes and meals. With 3 cards in your hand you have already 8 possibilities for combining. Whether 3 course meals or picnics, in a 5 star restaurant or out in the open air, anything goes. Players can cook together or take turns in telling about their processes and the results of the preparation. 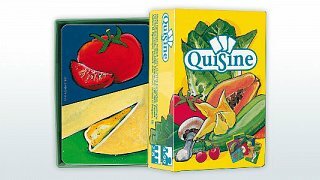 Caution: QUISINE is an appetizing game ' the best hors d'oeuvre since cards were invented. The book is alive with practical details and examples plus personal reports from a wide variety of card-users, both private and professional, from many different countries and cultures. An incitement to indepth use of the associative cards. This is an important source of information for all users of any of the titles in this genre. Author Waltraud Kirschke investigates the history and background of the associative cards. Each game with its unique theme is described and discussed as well as portrayed within the larger framework of the genre. Peking artist Han Wei, painted these 55 cards. Using a traditional Chinese watercolour style, she has created a collection of objects, scenes and personalities that inspire us in our story telling ' Chinese style. Originating in the myths and legends of old China we can respond to the cards with our own interpretations, and create brand new stories. If the cards are pulled randomly from the deck they surprise us and open a window into the world of imagination. As we lay the cards down in a progression, the story begins to unfold, and each story is a unique event. The SHEN HUA images from distant China can lead us on a new journey to creativity. Frame a picture card with a word card and explore the meaning of the set. 7744 different combinations are possible, and many more interpretations. Use alone as a solitaire and together in couples, families or groups. The OH Cards are found in homes, schools, clinics and centres for corporate training. 21 languages to date. These beautiful cards are designed to increase intuition, imagination, insight and communication. 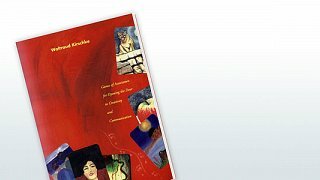 Around the world people are using these unique cards to reclaim their sense of self and their sense of place in this universe. 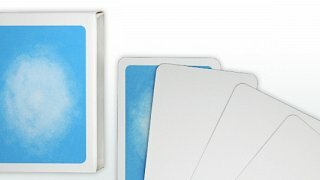 The OH Cards were created to put you in touch with yourself and with those around you. Naturalist Christian Gronau painted these cards, and they depict a broad span of the Earth's natural environments. They can appear to be documentary in style, some seem mythical, some more serious and some seem amusing. 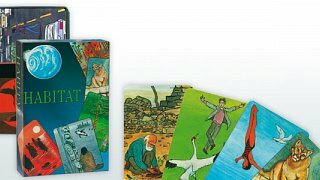 The word HABITAT which comes from the latin 'he/she/it resides', and the cards are a playful invitation to find connections and meaningful networks within our surroundings. The cards provoke questions about the interconnectedness of all things. These cards prompt countless role plays where one person can enact people from around the world. Thought provoking questions arise about the lives, aims and desires of these people. 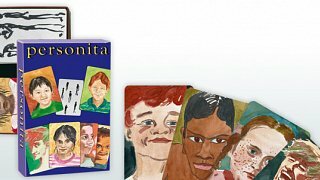 PERSONA cards give the user a chance to meet people of other countries and cultures through play and imagination. The dots on the interaction cards show how many face cards are to be used, and the arrows represent their interactions. It is the players that bring the characters to life. Raccoons are curious and playful mammals native to the forests of the Americas, from Alaska south to Argentina. These adaptable animals are found both in country and city, wherever trees and good foraging grounds allow them to raise and nourish their young. These photos taken by naturalists Aileen Douglas and Christian Gronau in the environs of their remote cabin on Canada´s Pacific coast portray raccoons at home in the woods and the pond. 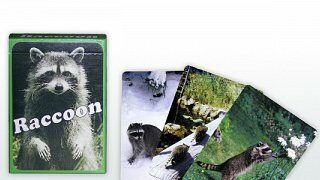 Let these beautiful cards stimulate you and your family to create your own stories about the furry bandits of the forest! Ely Raman and Marina Lukyanova painted pictures of the 77 children and young people representing all the countries and cultures of the globe. The 44 situation cards, help us to infuse the portraits with movement, touching and reflecting on our own inner stories. 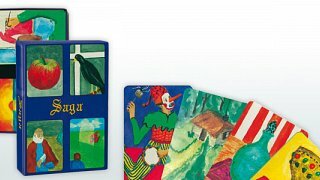 These cards are a playful way of using associations made from both memory and fantasy; a way of sharing imagination and at the same time expressing our creative self. With PERSONITA cards we are able to join in, communicate and play out the relationships of the world of young people, and the community they inhabit. The painter Walde mar de Andrade e Silva painted the world of the natives of the rainforest with whom he lived. 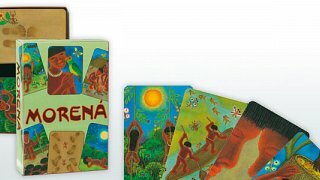 The 88 pictures and the 22 footprint track cards take us on a journey through the jungle and into the lives of a happy people. The loving scenes, the humour and the warm colours touch us and guide our play. This peaceful deck works well with children. MORENA means 'place of origin' in the local Xingu language. It was not long ago that most of the peoples of the world lived in tribes and clans, and these cards help us to re-experience that past. Ely Raman's latest storytelling cards of 55 paintings showing details and scenes from the world of myth. Ely had a long time interest in the pictorial representation of archetypes, and these cards reflect that interest. The MYTHOS cards, like the SAGA cards are for weaving the strange, the new and the wonderful into stories. Simply put, they inspire our imagination! 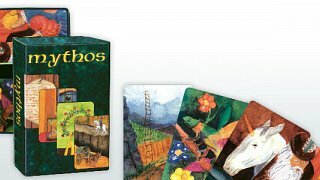 MYTHOS cards are easy to use, are full of surprises are a delightful complement to the other story telling decks. Each story is a new tale, formed by the creative imaginations of all the story tellers. SAGA and MYTHOS can even be used together. In Italian, 'ecco' means 'look!' or 'behold'. These paintings by John David Ellis invite us to look carefully at colours, forms, patterns. There are no titles and no correct meanings. Each of us sees something different. 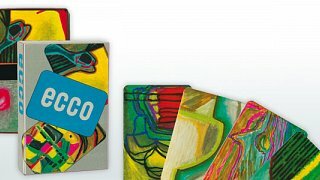 ECCO cards are a challenge for the imagination, a springboard into art, and a magic carpet into a world of fantasy. 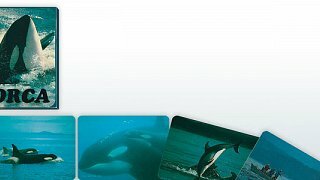 You can combine the ECCO cards, as you can with all the other picture decks, with the OH word cards, or even with other pictures from the other decks. Collages are pictures which include materials other than paint, 'for it´s not the material that is of the essence. The collage´s sole function is the composition itself' (K.Schwitters). Like ECCO, the BEAUREGARD cards open a door into the world of abstact art. In a song without words the music alone expresses the meaning. Likewise, abstract art in abstaining from depiction of object, figure, scenario or landscape, appeals directly through colour and form to the viewer´s response. 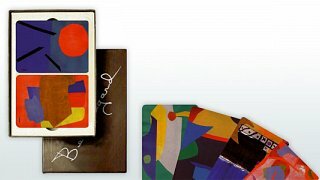 The Beuregard cards are free-spirited arrangements of form and colour that can deeply effect their viewers. We may also go beyond viewing to using these collages as a departure point for personal creative expression. Spontaneous associating can inspire the invention of stories, anecdotes or imaginary travelogues. Other responses to these vivid cards might find expression in painting or dance, music, theatre or pantomime. Alsacian artist Raymond E. Waydelich has a passion for combining found objects with painting to compose his works of art. 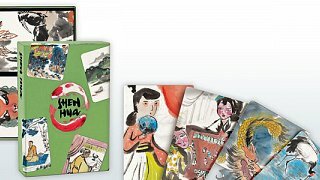 He has created 55 card-sized masterpieces spiced with his own zesty humour especially for this genre of playful tools. 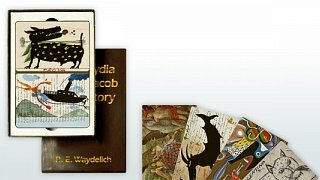 As well as being a work of art in its own right, each one of the LYDIA JACOB STORY cards is a departure point into a surreal world, a new and still unknown place occupied by a memorable collection of humans, animals, plants and (possibly) inanimate objects. Brought together against a backdrop of vivid landscapes, mysterious texts and astonishing maps, the characters of LYDIA JACOB’s world invite us to associate and invent along with their creator ' our fantasy can take over where the artist left off. 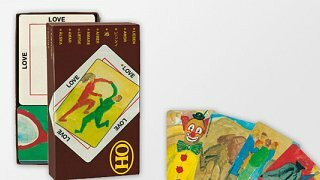 The LYDIA JACOB STORY cards can inspire us both to contemplative enjoyment of delightful artworks as well as to active creativity such as storytelling, theatre, music and dance. 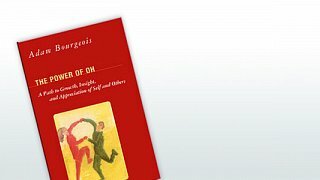 A 200-page workbook for the OH Cards by Adam Bourgeois complete with 88 b/w small representations of the OH picture cards, extensive bibliography and index. The book is organized into three parts. InPart I, Adam discusses the OH Cards and the realms of personal discovery ' the conscious, the unconscious, and archetypes. These chapters prepare the way for Part II and Part III which are about the 176 OH Cards and his insights and comments on each individual card, drawing upon myth, fairytales, word histories, and universal symbols. Space is provided after the descriptions for your own entries, through which this book becomes a personalised journal of your own discoveries. Please read the endorsements for this book under reports on www.oh-cards.com. 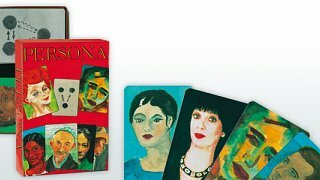 The COPE cards are the work of a Russian painter, an Israeli therapist and a German publisher. The images lead us to inner stories of woe and joy and to our expressing and sharing them. The pictures convey the emotional content of events, sometimes traumatic ones, and take us on a path to healing through the many beautiful variations. Each deck of COPE cards comes with a manual with examples of how they are used and the theoretical background of trauma-healing. The COPE cards work well combined with other OH cards. The artist Marina Lukyanova has painted 99 picture cards which depict scenes of couple-life. In collaboration with Ofra Ayalon, who has many years of working in couples therapy and couples counselling, the picture cards symbolize feelings, desires, needs, conflicts and healing patterns found in couple-life. The 44 action signs are suggestive of a road map for a couple's journey through the ups and downs of life. They offer fresh views, thoughts, feelings and actions. 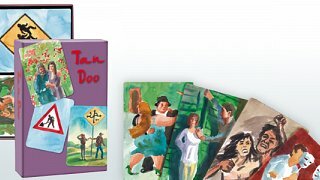 Tandoo cards can be used metaphorically like all the OH cards, and they can be combined with all the other card decks. They are great for personal use and professional use. The 65 cards of BOSCH reproduce 'The Garden of Delights' in its entirety. Regarded singly, each card reveals a miniature masterpiece of intricate detail. Laid out card-to-card like pieces in a puzzle (size 91 '52 cm) the individual images grow again into a unified composition. For more than five centuries Bosch´s work has inspired and fascinated artists and art-lovers alike. 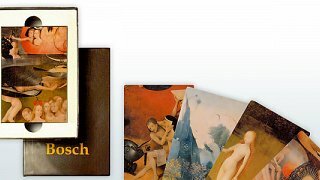 The Bosch cards can open a new door into his world and lead us on a walk through one of the most famous paintings in the history of Western art. With his painting 'The Garden of Delights' Hieronymus Bosch (ca. 1450-1516) created a monument out of the fears, hopes and fantasies of Europe in the Middle Ages. A master storyteller in the language of images, Bosch populated his creation with fabulous beasts and creatures of fantasy as well as the people of his time and culture whose imaginations they inhabited. The 99 picture cards reflect the stresses of daily life as well as revealing possibilities for relaxation. Daily pressures can be both a stimulating elixir of life and also a painful burden resulting in bad moods, upsets, or even illness. How can we find our own resources in order to unburden ourselves? The 44 animal cards symbolize qualities that can help us discover and strengthen our resilience. Metaphorically, they provide emotional and/or conceptual support. All 143 vividly-coloured cards were painted by the versatile Czech watercolour artist Emilie Marti. 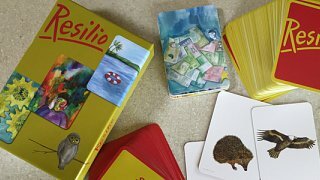 Like all of our cards, RESILIO can be combined with other OH-genre decks. It can be used privately, for instance to keep a stress diary. In a professional context, RESILIO can be an undogmatic tool for helping ' in an unbiased, value-free way ' to evoke people’s inner stories. Ely Raman has painted the 55 cards that show characters, places and things from a land that never was and always is. Each card is a jumping off point into a familiar myth or fairy tale, or into a new story that has never been told before. The SAGA cards reawaken the joy of spontaneity, delight of surprise, and memories of childhood dreams. The pictures invite us to journey, with or without a child, into the world of make-believe, dreams and magic. CLARO has coloured varnished backs on the cards and white unvarnished fronts. You can colour or paint these cards yourself with art materials of your choice. Your own drawings and paintings become just as playable as te other decks. We will contact you as soon as possible on completion of your purchase of OH Cards or books with details of the progress of your order. PKP Balance Kinesiology uses PayPal shopping cart services. For your privacy and security, your purchases and any data you enter are securely stored at PayPal and are not recorded on our servers. We will be notified of your purchases by PayPal on completion of your payment. We do not accept any orders to addresses outside of the UK, any orders placed from other countries will be cancelled and refunded, however in that case you may be still liable to currency transaction fees which will be entirely your own concern.